Due to the innovative systems that stair lifts feature, seniors and people with disabilities can have access throughout their whole house again. Therefore, they won’t longer have to struggle with going up and down the stairs when their medical condition doesn’t allow them to. Since stair lifts come in various models, each one with distinct features, it is essential to look for information that will help you make the best stair lifts comparisons. So, let’s find out which the most popular mobility equipments are! We present you the Acorn 180 Curved Stair Lift and the Bruno Elite Stair Lift SRE-2010. Due to all the features that it is equipped with, the Acorn 180 is one of the best stair lifts that you can find on the market. This device was built to suit curved staircases, and besides the fact that it features a sturdy construction, it has an aluminum rail, so you can see it as a stylish addition to your interior design. In order to avoid any type of damages to your house structure, the rail was designed to attach to the stairs, and not the walls. In order to allow easy access to the stairs for other people in the house, this stair lift incorporates folding seat, armrest and footrest. Furthermore, this impressive stair glider includes two remote controls for easy maneuvering, and it includes safety sensors that can detect obstructions, and stop the stair lift from bumping into obstacles. The only disappointment that we found in this product is that it features a 265 pounds capacity, so people who weigh more than that should direct their attention towards other models that can support more weight. This straight stair lift features 7 different options for the upholstery, which means that potential buyers can choose the color that can complement their house decor the most. 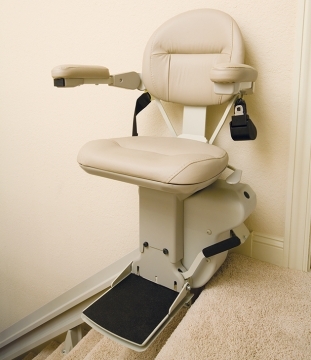 The Bruno Elite Stair Lift SRE-2010 integrates a rack-and-pinion drive system to enable smooth movement, and it has a 400 pounds capacity, which makes ideal for heavier users. Just like the Acorn 180 Curved Stair Lift, this device can be folded away so that it won’t block the stairs when not in use. A very important advantage that you can get with this unit is that it comes with a padded and adjustable seat for enhanced comfort. Furthermore, the seat has the ability to swivel to allow users to exit and enter their stair lift easier. In order to avoid paying large repair bills, the Bruno Elite Stair Lift SRE-2010 comes with a diagnostic system that monitors the stair glider to discover if there are any malfunctions to worry about. Therefore, maintaining this smart device in best conditions will be easier than with other models. Next Article Mobility Scooters vs Wheelchairs – Which is the Best Option? Electric vs Vent-Free Gas Fireplaces – What is the Difference?